Apalachicola City Hall is located at 1 Bay Avenue, Apalachicola FL 32320; phone: 850-653-9319. 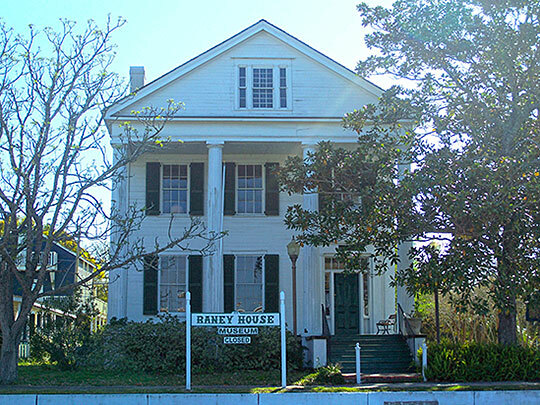 Photo: David G. Raney House, ca. 1840, 128 Market Street, Apalachicola, FL. Listed on the National Register of Historic Places in 1972. Photographed by User:Ebyabe (own work), 2008, [cc-by-3.0 (creativecommons.org/licenses/by/3.0)], via Wikimedia Commons, accessed June, 2014. The first settlement was established in 1821, incorporated in 1828 as West Point, and renamed Apalachicola in 1831. The Cape St. George Lighthouse on Little St. George Island, built in 1833, stands today as a weathered reminder of days gone by. By 1837, Apalachicola had become the 3rd largest port on the Gulf of Mexico, shipping cotton brought down the Apalachicola River on steamboats from the plantations of Alabama and Georgia. It was cotton that took a fancy to Apalachicola, and for a glorious, though fleeting period, paved the streets with gold. The City featured a race track, an opera house, and plush hotels offering balls, socials, and gambling. Cotton was king and the river brought it all to Apalachico1a. It was during the height of this great prosperity, that Dr. John Gorrie invented the artificial manufacture of ice, forerunner of modern air conditioning and refrigeration. At the same time, Dr. Alvin Chapman, world-famous botanist and author of "The Flora of the Southern United States," resided in Apalachicola. During the war between the States, Apalachicola was blockaded by Union forces, in an attempt to halt ships carrying needed supplies to the Confederacy, and to destroy salt producing installations. Apalachicola's sentiments were divided during the war, and in 1862, the city quietly fell to Union forces. The destruction of railroads during the Civil War, and the cypress milling boom in the 1880's were enough to keep the steamboats on the river up through the 1920's and the town's economy flourished. After the halcyon days of the cypress boom, the 1840 cotton port of Apalachicola became a center of the oyster industry in Florida. Today, Apalachicola headquarters a United Nations Biosphere Reserve and National Estuarine Sanctuary of 193,118 acres, and tourism and seafood form the basis of the economy. The original city layout was planned in a one mile square-grid, and begun in the mid 1830's by the Apalachicola Land Company. It is said to have been based in part on the original plan for Philadelphia, with a large central square and five smaller squares. The original intent was to have Washington Square, the larger square, as the center of town and the surrounding five squares as secondary nodes of development. However, the plan was flawed from the outset since the importance of the river and bay was overlooked. It did not take into account that commercial activity naturally would be centered along the waterfront. Residential areas were also likely to develop close to the water to take advantage both of the cooling breezes and the views. The city did, in fact, develop in the latter manner, as shown on an 1837 map, and continued in this pattern over the years. According to a 1915 map of the city, structures were beginning to appear throughout the city limits although they remained concentrated along the river and the bay. Historic Preservation document, Introduction, www.cityofapalachicola.com, accessed June, 2014.